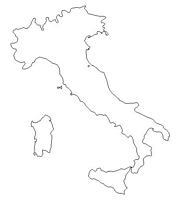 Roads – Go to MapQuest and enter an address to get a custom map of Italy. Flags – Click on the map of Italy to see each region’s flag. Travel – Michelin folding map. Italy Road Atlas Spiral – A highly-detailed spiral-bound book atlas by Michelin. 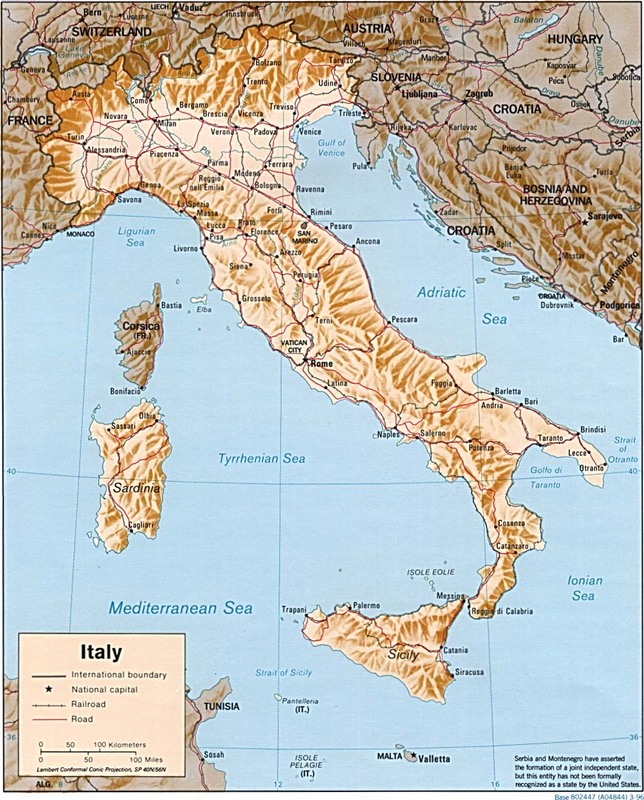 National Geographic Italy Wall Map – Richly detailed, this National Geographic print of Italy shows country boundaries, parks, cities and towns, lakes, rivers, and highways. Italy Political Wall Map – Exclusively developed by Maps.com and GRAPHI-OGRE and not available in any store, this wall map was created using high resolution vector digital imagery with state-of-the-art print on demand technology. This process allows Maps.com to offer over-sized laminated wall maps. Ideally suited for light reference, this political wall map includes cities, airports, rivers, lakes, and major roads (not numbered). Available in three sizes. 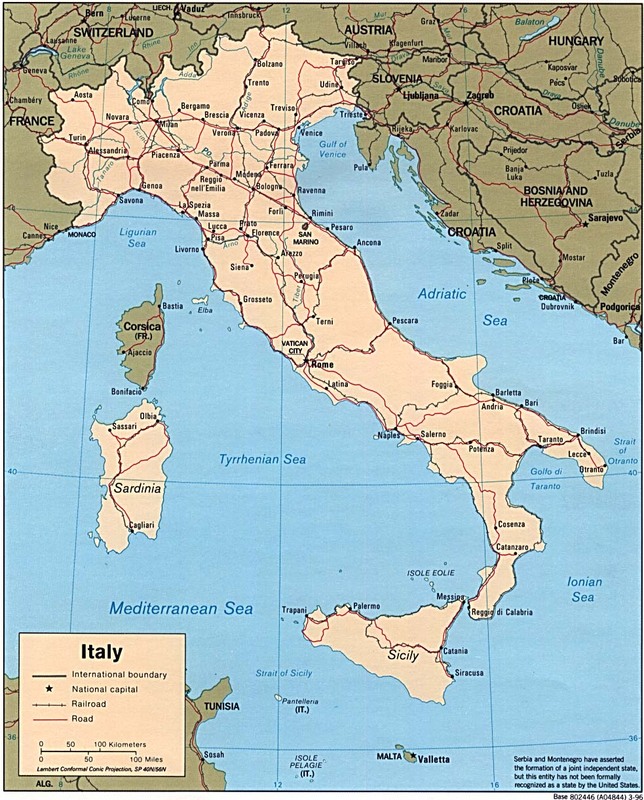 Click here for all Italy map products – Maps.com! At 116,303 square miles, Italy is about the size of Arizona. It is in Southern Europe and is a peninsula extending into the central Mediterranean Sea. Its terrain is mostly rugged and mountainous, with some plains and coastal lowlands. Italy’s climate is predominantly Mediterranean; Alpine in the far north; hot and dry in the south. The highest point is 15,578-foot Mont Blanc de Courmayeur (a secondary peak of Mont Blanc). About 2000 B.C., the tribes of Italy began engaging in trade which was to delineate the country’s history. The Roman republic was founded around 500 B.C., and became prominent with its concept of specific laws, centralized government, city planning, and engineering. The cultural influence shifted to the east (Constantinople) as Rome declined from a population of nearly one million to about 20,000 in the Dark Ages. The 12th and 13th centuries were characterized by strain between the Imperial Power and the Papal Power. The 15th century marked the beginning of the Italian Renaissance, a period recognized by the revival of the economy, resulting in renewed awareness of classical art, improved quality of life, art, literature, music, university study, and free trade. 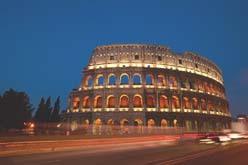 As the Renaissance grew into the baroque period, Rome emerged once again as a major power. Italy then struggled with the dominations of France and Spain, leading to the unification by Garibaldi in the 1860s. Italy’s 58,057,477 people are predominately Roman Catholic with mature Protestant and Jewish communities and a growing Muslim immigrant community. The languages are Italian (official), German (parts of Trentino-Alto Adige region are predominantly German speaking), and French (small French-speaking minority in Valle d’Aosta region). Italy’s chief industries are tourism, machinery, iron and steel, chemicals, food processing, textiles, clothing, and ceramics.